when you camp in the Florida Keys. In fact, you can snag some of the best off-season rates between May and October, so making your dream a reality is affordable as well. Campgrounds are scattered throughout the Keys and you can choose from every type of camping experience — from primitive camping to “roughing it” in a luxury RV. Campsites vary according to location. Many offer waterfront campsites — some on the beach and some along canals. Some campgrounds offer pools, spas and plenty of activities, while others offer only the simple pleasures of Florida — natural surroundings, awesome sunsets and quiet nights. A unique experience for experienced and well-equipped campers is the primitive camping at Dry Tortugas National Park. Located about 70 miles west of Key West, the park is only accessible by your own boat or the Dry Tortugas Ferry Service. Although day trips to the park are popular, not many are up for the camping regimen. It means packing up all of your own equipment and supplies (including water) to share limited space and virtually no services. It means adhering to strict rules, like no wood fires and no ropes attached to trees; and, it means taking your own trash back to the mainland with you. Still, who can resist the breathtaking sunsets and nighttime skies? When visiting the Keys pack water or beach shoes. They are a necessity to enjoy the beach because of the pebbles, shells and hermit crabs. This is pretty typical of most Keys beaches… they are a bit rough. Be sure to bring along floats when you camp. In many areas the water is shallow and not suitable for swimming; however, there is still plenty of fun to be had with floats, beach balls, and other water toys. Just because the Keys are islands, don’t think they are without bugs and critters. Raccoons frequent campsites at night and “noseeums” will find their way into your tent through the screen. 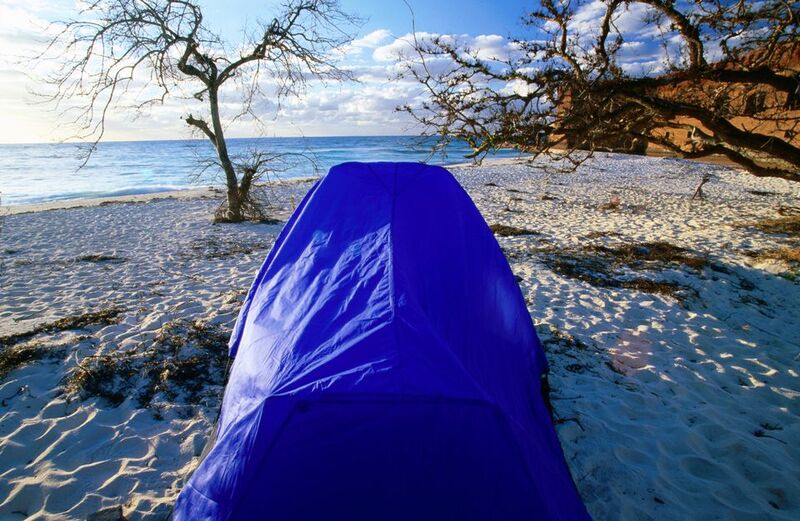 Don't forgot the first rule of camping in Florida… never, never leave home without bug spray! Overall, camping in the Keys is an experience of a lifetime. Whether you go to just enjoy the camping experience or take advantage of area tourist attractions or water sports activities, one thing is certain… the sunsets are absolutely unforgettable and photo opportunities endless. Bahia Honda State Park - Tent and RV campsites and rental cabins are available, offering some bayfront sites. Bluewater Key RV Resort - This is a RV ownership and rental resort with 81 large RV sites. Many are right on the water with full hookups and it's just 10 miles to Key West. Boyd's Key West Campground - Oceanfront RV and tent resort camping minutes from Key West's Duval Street. Swimming pool, marina and more! Just 5 miles to Key West. Curry Hammock State Park - Full facility RV campsites, including some ocean front. Dry Tortugas National Park - Bring-your-own-gear primitive camping up to three nights with only access by your own boat or the Yankee Freedom II ferry service. The Dry Tortugas is about 70 miles west of Key West. Space is limited and reservations are required. Fiesta Key Resort KOA - Waterfront campsites — both RV and tent —, pool, hot tubs and so much more. Located at Mile Marker 70 on Long Key. Grassy Key RV Park & Resort - Newly renovated park in Marathon with spacious campsites, sparkling pool, and views of the Gulf. John Pennekamp Coral Reef State Park - Full facility RV camping including boat facilities. Jolly Roger Travel Park - Shady RV and tent campsites with plenty of water activities. Key Largo Kampground & Marina - Whether you prefer the sun or shade, you'll find the perfect spot for your RV or tent. Launch your boat from the new deep-water ramp and dock your boat on the new floating docks. Located at Mile Marker 101.5. Long Key State Park - Oceanfront tent and RV campsites with full hookups available. Pelican Motel & Trailer Park - A 9-unit hotel and 85 RV sites situated on Grassy Key at MM59 on the Gulf of Mexico. There are plenty of amenities. Sugarloaf Key Resort KOA - Nestled between the Gulf of Mexico and the Atlantic Ocean, this beachfront resort offers RV and tent sites with plenty of activities for the whole family to enjoy. Just a few miles to Key West.